Next you'll be taken to Onboarding page where you'll learn how to add your first dashboard. You can skip this step as well, but we strongly recommend you to try this step first. These are just a few template ideas that can help you quickly create your dashboard. Each template has predefined widgets that we think are suitable for this particular report type. In this step you are asked to add sources of integrations that are required for selected template. Later on, in app Account Settings > tab Sources, you will be able to add all other sources of integrations Reprotz have integrated. NOTE: In step 2 and 3 you need to add all requested sources and desired properties for which you want to create a report, only then will those widgets be automatically created on your dashboard. 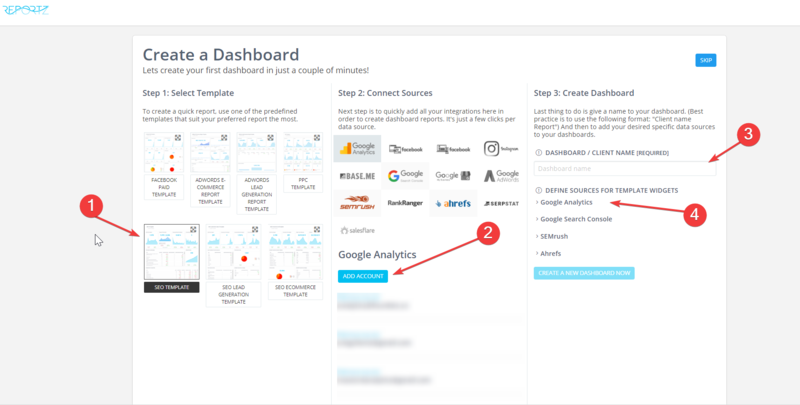 If you add only one, for example Google Analytics source (step 2) and (desired property step 3), you'll see only GA widgets on your dashboard.